Jacquie Severs: Logo Love: Vrieden! In the Netherlands May 5th is Liberation Day. Liberation day marks the annual anniversary of the end of Nazi occupation during World War II. The nation was largely liberated by the Canadians, assisted by the British and Americans. As a result, a friendship between nations has been established, and now that friendship is celebrated in a very appropriate manner. The beer is a unique Belgian-style witbier brewed with juniper berries and organic maple syrup, ingredients representing The Netherlands and Canada respectively. My friend Jordan Bamforth is the in-house designer for Beau's and he created a very cool label for the bottles, and a lovely poster as well. I have long admired Jordan's style, but this I love because it captures the message of friendship between the Netherlands, symbolized by the tulip and orange colour, and Canada, symbolized by the red of the heart at the centre of the image, as well as the maple leaf found in the letter "i". It really is clever and attractive as well. 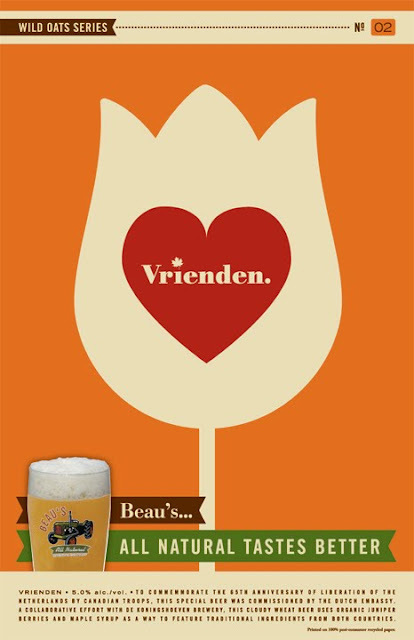 This week, Beau’s announced the name of the beer – Vrienden, Dutch for “friends” – and tagged it as being No. 2 in their Wild Oats series of experimental brews. The beer will be launched tomorrow - Monday, May 10th alongside the arrival of Princess Margriet of the Netherlands. It will be exclusively available at the House of Orange festival of Dutch and Canadian creative culture, taking place in three clubs at 56 Byward in Ottawa from May 10th to 23rd. Here's the poster (as always, click to see full size).